how long it takes for the machine to make the bread? I use Sunbeam, the basic model. I just use the "dough" mode to knead the dough for me. Every bread maker would be different. Mine just takes about 20 minutes to knead dough. But I usually turn it on twice and knead my dough twice in order to get enough gluten. Don't know about Breadman one. You can ask the staff at Target to help you out. Or just browse the manual there before you buy it and get the info you need. Different models have different designs. Love all your recipes! 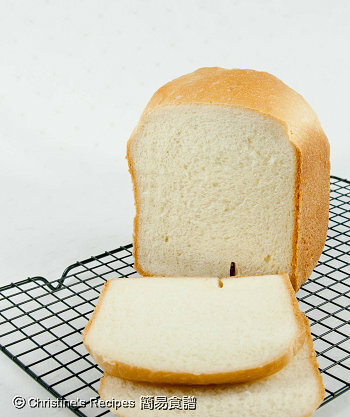 I tried to make this white bread today using my Oster bread machine. The bread came out a little hard & inside is not as white as shown on yours. I double checked all the ingredients & steps and they are according to yours. Do you know what could be wrong? Thanks for creating a "bread" topic. It's cool. I just got my sunbeam bread maker today. I am going to make this white bread. Should I chose 1.5lb loaf or 2-lb loaf? what is the difference? 1.5lb loaf is small and 2-lb loaf is big. For this recipe, it makes a small loaf. http://www.foodnavigator.com/Science-Nutrition/Honey-powder-proves-shelf-life-booster-in-bread-study says "the addition of honey powder at a level of 5 to 10 per cent improved the baking quality by retarding staling and increasing shelf life." Hmm, maybe worth a try. Great article, thanks for pointing. I haven't seen any honey powder around here. Hey, if you test this new method, please let me know how it goes. 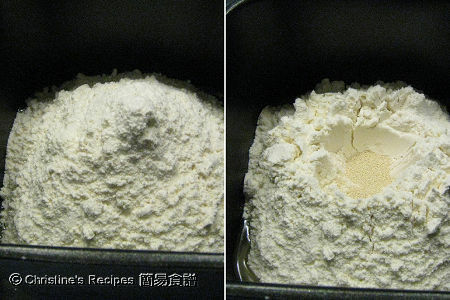 You didn't use Tangzhong in this bread, would the bread become hard after few hours? This is not a tangzhong bread, so can't keep soft for days as tangzhong ones. I sealed it in a plastic day after cooling down. It got harder on the next day. 1: this is a 1.5lb recipe? am i right? 2: can i substitube olive oil with melter butter? same ml? 3: can i substitute water with milk or soy milk? same ml? Thanks for letting me know that my blog gets you motivated to bake breads. You'll love it. 2. Why not? Try to heat about 40 grams of butter in a microwave oven, and then measure out the same ml from it. 3. Sure, you could. Same ml. The crust of the bread made by breadmaker is a bit thicker and harder than those are baked by oven. And the end result might be different from brand to brand. may i know how much i need to put in TongZhong for this recipe? as my breadmaker had bigger size , can i use this recipe and x 1.5 more for all ingredients? Sorry, I don't have time to convert this recipe for using tangzhong and test it. Please take a look at this Tangzhong milk toast, easier for you to start with. Can you give some guidance how to slice the loaf? I'm using serrated knife, but couldn't slice it evenly. Should I cut it while it's hot or cold? Btw, I happened to spot a bread slicing guide at Robins Kitchen, but didn't take it, for the price tag is not within my budget. Take a look to see if it suits you. Can I add Tongzhong into this white bread to make it softer? If yes, how many should I add? Besides, I like your recipes so much. Thanks for sharing. Can I add 'tongzhong' to make it more soft? If yes, how many should I put? Besides, thanks for sharing the recipes, I like it so much! Yes, you can add tangzhong. But I haven't tried to convert this recipe with tangzhong. Let me try if I've got some time. Then get back to you if I've done. Christine, I followed your recipe but the bread crust especially the bottom was very hard while the inside was very soft (too soft). I bought a different bread maker though! Did you bake your bread in the machine? It's quite normal that you'll get loafs with thicker crust from breadmakers due to the long baking time inside.